In the 1980's and 1990's British society was convulsed by the Tories plans to smash the labour movement and penalise the working class. In 1984-5 the attacks on the miners led to a major industrial dispute which generated widespread sympathy for the miners by working people in NI. The Poll Tax, an absurd piece of repressive taxation, was opposed by millions in Britain, eventually the Tories were forced to backdown. 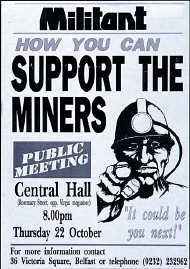 In Northern Ireland there was generalised support for the miners. Collections were held in workplaces and in housing estates to support those in struggle. (Remember that it's decades since there were any N Irish mining.) The size of the collections was such that NI actually raised MORE per head than any other region of these islands. 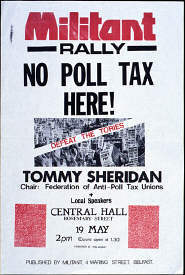 Tommy Sheridan was one of the key leaders in the anti-poll tax campaigns in Scotland. He later went onto become a Scottish SP member of the Scottish parliament. The Tories never brought the tax into NI as it was thought it might actually generate more working class unity than was desirable.